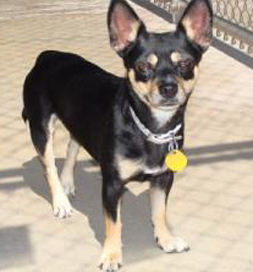 Montana, a Chihuahua, is microchipped and ready for a new home at Animal Rescue League of El Paso. In Britain, there are an estimated 13.3 million dogs, and Pensavalle says about 8 million dogs already have microchips, or about 60% of the pooch population. By contrast, there are approximately 78.2 million dogs in the U.S., but because of multiple registries for microchips and adopters’ failure to register the chips, it’s hard to guess how many dogs in the U.S. are microchipped. (Howstuffworks.com says that about a quarter of European pets — not just dogs — have a microchip implant, while only about 5% of the approximately 130 million dogs and cats in the U.S. are microchipped). When the law was proposed in Great Britain, an article in The Christian Science Monitor reported that opponents charged that the government was becoming more of a nanny state, so you can bet that a federal bill in the U.S. that mandated microchipping would have a tough time making it through Congress. In the U.S. mandatory microchipping has already occurred on a local basis. For instance, the El Paso, TX, website reports that such a law went into effect in the border city in 2007. But as for making such a law nationwide? I suspect advocates would have to chip away at strong opposition to get federal legislation passed no matter how much it would help our pets get safely back home when lost. Learn more about microchipping from HomeAgain, a national pet recovery database. Tell us: Would you support mandatory microchipping? Why or why not?